This Downtown Highlands NC home for sale is a true gem. 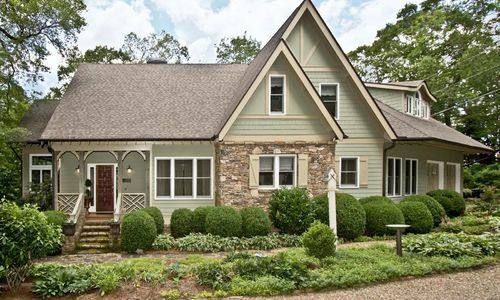 80 Margarets Lane is a lovely Arts and Crafts style custom 3 bedroom, 4 1/2 bath home that was built in 2000. The location on Big Bear Pen is one of the most desirable in Downtown Highlands. The Kelsey Trail is out the front door, offering a great way to walk to the heart of Downtown. 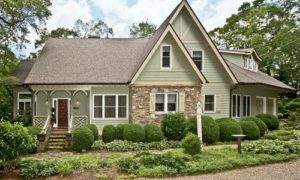 This Margarets Lane home should be on your Highlands NC property list! The great room is a wonderful space inside this Downtown Highlands NC home. Here you will find a spacious room boasting great natural light, a beamed cathedral ceiling, and a large stone fireplace. The kitchen is a great space for any avid cook and showcases beautiful English cabinetry, granite counters, and a large pantry. The home is great for entertaining, with a formal dining room and great gathering space inside and out. The main floor master suite features his and hers walk-in closets and space for an office, nursery, or sitting area. In addition the master bath does not disappoint, complete with a separate tub and shower and adding laundry room. Upstairs are two additional guest suites. There are many wonderful features inside this Highlands NC home for sale, including a media/family room, plenty of storage, a sunroom, and a covered porch complete with a wood burning fireplace, and views of Whiteside Mountain. The two car garage is a perfect place for parking or storing your toys! In addition there is a one bedroom, one bath guest cottage. This Highlands NC home for sale has seen many updates over the years an is in great condition. Contact our team at Berkshire Hathaway HomeServices Meadows Mountain Realty today to schedule a private showing of 80 Margarets Lane. We welcome the opportunity to help you complete a successful Highlands NC property search. Let our knowledge and experience serve as your guide to the area. Let us show you this Downtown Highlands NC home for sale and see if it is a fit for you and your family.